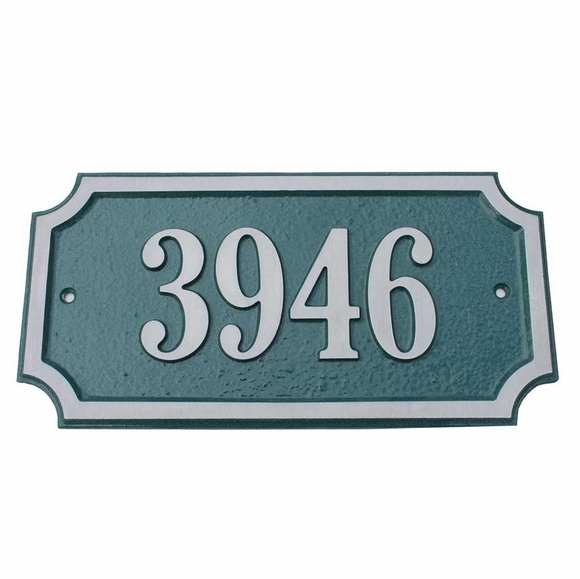 Enhanced Rectangle Street Number Plaque - - solid cast aluminum rectangular house number sign with decorative cut-out corners. 11.625"W x 5.875"H address sign holds one line of personalization, typically the street number. Wall mount. Made in the USA. Solid cast aluminum plaque comes in 16 colors with aluminum personalization and border. Decorative rectangular shape features circular cut-in corners. Dimensions: 11.625" x 5.875"; weighs 2 pounds. Also available in solid brass construction. See top item in Related Products.